I recently ran across a series of photographs documenting the degradation of Urban Detroit. 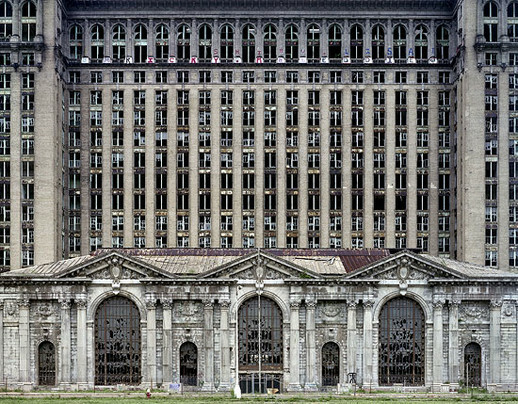 In particular, this photo of Michigan Central Station caught my eye and made me think. Michigan Central station was in use from 1913 till early 1988, and has been more or less unused since. It’s state seems to mirror the state of the urban core of the city in general. Detroit is the largest of the rust belt cities (Cleveland, Buffalo, Detroit, Milwaukee, Toeldo, Hamilton, Sarnia, Windsor, etc.) and quite possibly the most lost. It is a modern oddity – a large, once affluent city that is crumbling before our collective eyes. Possibly even the first post-industrial non-wartime ruin in the Western world. Regardless the reasons for the city’s current plight, this photograph of a once-great building makes me sad.